With a mind-blowing power reserve of more than 1,000 hours  - that's more than 40 days - the T-1000 doesn't simply push back the boundaries of the possible, it destroys them and creates its own reality. After the successful presentation in January of The Predator, their first watch with a round case, Rebellion launched themselves into the creation of a never-before-realized challenge: creating a watch with a power reserve of more than 1,000 hours! 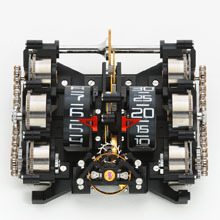 It was in June 2008, after the famous 24 hours of Le Mans car race, in an atmosphere rich with the smell of motor oil and hot engines, that the team at Rebellion thought, "If we can transform these fine-tuned racing thoroughbreds into 24-hour long distance endurance racers, why not do the same with a watch? Why not see just how long the power reserve could be?" The body of the T-1000 was designed in a collaboration of Eric Giroud and Rebellion. The case was developed concurrently with the movement to ensure completely harmonious integration. There is a sensation of flying as the viewer gazes down through the massive opening to the vertical roller-borne time indications below. Attention then plunges towards 6 o'clock, where the inclined double balance releases the immense power at a precisely controlled rate. A window in the side of the case reveals one of the mainspring barrels, with markers providing a natural "Fuel Gauge" of the state of the power reserve. 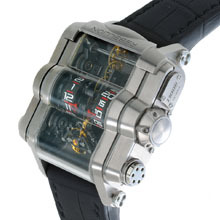 Housed three on each side of the body are the six mainspring barrels providing T-1000 with its colossal energy reserve. The over-sized winding lever endows the T-1000 with a strong and virile identity as well as an ergonomically tactile pleasure while "filling the tank". The streamlined downward taper of the case from the centre to 6 o'clock furnishes further evidence of Rebellion's car racing pedigree. A pedigree reinforced by the fact that a patented time-setting clutch activated by a push button in the crown makes setting the time as simple (and as pleasurable) as changing gears. The three rounded structures each side of the case provide a hint to the complex engineering within, while the innovative architecture of the majestic case is in perfect tune with the demand for exceptional contemporary horology. The power reserve of more than 1,000 hours is possible thanks to the six mainspring barrels that provide the T-1000 with its exceptional capacity. In a patented system of energy distribution, six barrels are wound in parallel via a central prop shaft driving two chains, but they discharge in series (2 x 3) to optimize a regular power supply to the regulator. The technical ability behind the realization of this elegant technical solution came directly from Rebellion's long experience in endurance car racing and the Rebellion Racing team. Winding system : Patented system of six mainsprings wound in parallel by chain and prop shaft. The barrels discharge power in series to provide an optimal torque curve. 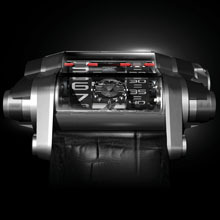 Buckle : patented folding clasp with micrometric push button regulation allowing easy adjustment of length on the wrist.